Vital Juice co-founder Amanda Freeman brings her popular hybrid workout from Los Angeles to midtown. Similar to classes like SPX Fitness or Pilates Plus, Freeman calls her incarnation “SLT,” short for Strengthen, Lengthen, and Tone. The 50-minute class ($40) is a mix of cross-training, cardio, and Pilates that’s done on what Freeman describes as a “souped-up Reformer.” Opening September 6. 350 Amsterdam Ave., at 77th St.
It’s SoulCycle’s first new studio since Equinox acquired the brand in May; the original Upper West Side location will move to larger, 1,900-square-foot digs on 77th Street and Amsterdam. Expect the same, grueling 45-minute sweat-a-thons ($32 each), as well as more bikes and lockers, a spacious changing area, and a retail space with plenty of branded gear. Opening October. In more Equinox news, West Village gym Printing House – another one of the company’s recent additions – will complete the gut renovations they started by the end of September. And while updated features like larger group fitness studios will be added, the awesome rooftop pool will thankfully stay the same. Membership rates from $140/month. Re-opening at the end of September. Founder Brian Delmonico takes an om approach to teaching his 60-minute mind-body boot-camp classes ($20 for first trial session). In addition to the requisite push-ups and core training, sessions include yoga, stretching, and meditation. The workout found its first permanent home in a loft space in Chelsea, which opens in September and will also offer one-hour Vinyasa classes at $10 a pop. Opening September 6. Physique 57, one of New York’s more-popular Lotte Berke-derived workouts, is further expanding with a third Manhattan outpost, located on the Upper West Side in the Ansonia. 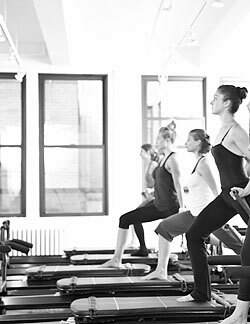 They’ll offer their signature 57-minute barre classes out of two studios, plus a handful of new workshops that will be announced in the coming months. Opening August 16.